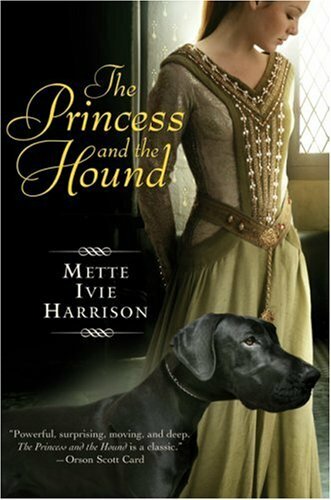 With us today, we have Mette Ivie Harrison, author of The Princess and the Hound, The Princess and the Bear, The Princess and the Snowbird, Mira, Mirror and the upcoming Tris and Izzie. Her bio tells us that her name, Mette is Danish and when spoken, rhymes with 'Betty'. She currently lives in Utah with her husband and five children. And, she tells us 'I write during nap time, or at 4 in the morning, or while the broccoli for dinner is burning. Whenever Ig et a chance. I love to write the kind of books that I love to read. And I love to discover what it going to happen next, just like a reader would.' As if being a writer isn't enough, she also participates in triathlons. I wrote the first draft of The Princess and the Hound in 1997, and in that version, it was a retelling of the story of The Princess and the Pea. Doesn’t sound likely, does it? What happened as I was writing the first scene, in which the bedraggled princess knocks on the door of the castle to escape from a rainstorm, was that she came in with this hound. This big, black hound whom she would not let anyone take away from her. It was obvious they were very close, that their relationship was not like any other hound and girl. And Prince George, who told the story from the first, could not stop thinking about this princess and this hound. He had to find out the mystery behind their relationship. So, it was a mystery and a romance from the beginning, and it was based on a fairy tale. But as I rewrote it many, many times over the next eight years before it was accepted for publication, it took on its current hints of Beauty and the Beast. In fact, I thought of it as a new fairy tale, a story that would make the reader sure that this was a fairy tale she had missed reading from the original Grimm’s collections, but in fact was my own invention. It wasn’t until my editor pointed out the hidden Beauty and the Beast that I realized she was right. There are many fairy tales based on Beauty and the Beast, however, and it is only if you look for it that you will see that as a backstory. Some readers have complained that The Princess and the Hound isn’t a retelling at all. Well, it’s not like any other retelling you’ve probably ever read. I think my brain is just twisty this way, and as soon as I hear a story, I start thinking of the way I would tell it, and by the time I actually tell it well enough that it could be published, it doesn’t look very much like the original. I got some of the same complaints from readers of Mira, Mirror. If you want a retelling of Snow White, you might not be happy with Mira, Mirror, because Snow White appears in one sentence and then disappears. It’s the story of the mirror and the evil queen before Snow White and after. It’s my own story, one only I could tell. I remember an experience at a writing conference I went to in 2010. Candace Fleming was there and she was teaching a section on writing historical non-fiction. She had just finished writing The Lincolns, a wonderful biography of Abraham and Mary Todd Lincoln, and she told us about a bit of historical fact. Mary Todd had been stopped by a night watchman while running by the streets of Atlanta in the wee hours of the morning. The night watchman thought she would only be running toward an elopement, but in fact, she was going to an early morning poetry class, held at that hour so that the oppressive heat of the summer did not bother the students. We were supposed to work on telling only the facts of the story, adding in no details we could not verify. This was something I could not do. Really. I just wanted to go off in all directions on my own. In fact, I started working on a novel called The Asylum after this workshop, using the idea of a girl sent to an insane asylum (as Mary Todd Lincoln was sent by her own son after Abraham’s assassination) for no reason other than that she would not do as she was told. Tris and Izzie, which will be out in the fall with Egmont, is a project I have been thinking about for a long time, as well. I studied German Literature in college and have a PhD in it. I read Tristan and Isolde in the original middle high German in grad school, and also listened to Wagner’s opera of it. It’s one of the greatest love stories of all time, but it’s also very frustrating to me. It doesn’t have very modern sensibilities about women, and I object to the adultery scheme. Plus the ending is wretched, not romantic at all. And I hate love triangles. So why in the world would I choose to do a retelling of that story? Well, the challenge of it always gets me excited. I feel like I tend to retell fairy tales I hate more often than ones that I like, because I want to fix them. Tris and Izzie is my “fixed” version of the original. I get to play with a love triangle, but in a way that I don’t find objectionable. I often find that when I read a standard romance with a love triangle, I want to smack all three characters around. What are those two hot guys doing, waiting around to be chosen? They need to get a life, both of them, and dump her. Plus, what is her problem? Doesn’t she know she can’t hold guys on a string like that? If she seriously can’t choose, then she’s too stupid and young to have a romance right now anyway and she should go to an all girls’ school until she grows up. So, in my version of the love triangle, you can imagine things are a little different. I don’t want to give it all away, but I hope readers like my modern take. Tris and Izzie is also the first time I’ve had a chance to try out a humorous slant on a retelling. It’s not slapstick funny, but Izzie tells the story and she has an ironic twang to her depiction of events that I think works well. There’s lots of action and big save the world stuff going on, but she can also make fun of herself and what’s going on at the same time. It may not feel like it’s as serious a love story or a meditation on life as The Princess and the Hound, but there’s some serious stuff hidden in there, too. I mention how I feel about love triangles, about girls who can’t choose who they love, and about girls who are fighting over the same guy. Also, what secrets do to relationships. And what has happened to our scientific world in which we have no sense of magic anymore. Those are some of the big themes that I think are touched on, while the readers are having a good time reading. I've got a new website up: www.trisandizzie.com which I’m trying to promote. There is a “Dear Izzie” vlog there, where “Izzie” answers questions for the romantically and magically challenged. So I will give a free book away to the best question posted here in comments, with the understanding that all questions can be used on my blog. Hope you have fun! What a wonderful post Mette! It was awesome hearing more of the story behind the book. 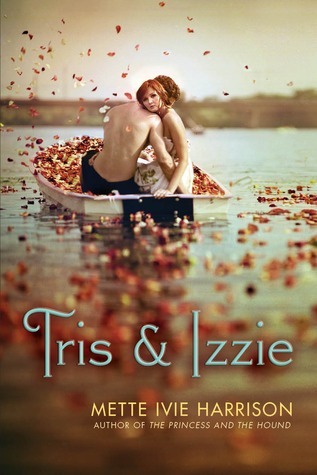 And Tris and Izzie looks amazing! Can't wait to read it!! Isn't that cover gorgeous?! Alright everyone! You heard her! Go to www.trisandizzie.com and come up with some questions for Izzie for your chance to win a copy of The Princess and the Hound! Be sure to leave your questions in the comments section of this post!! I read the excerpt for Trist an Izzie and thought it was very interesting. 1) Who are the models for the beautiful 'Tris and Izzie' trailer? 2) How do you get your boyfriend to choose you over tonight's football game? 3) I get really nervous around cute boys...Is there a potion that can help me with 'sweaty palms'? 4) I have a crush on my very handsome best friend, but I notice he tends to prefer short and not very bright skinny blonds (that are my total opposite). How do I get him to look at me as more than just a friend? 5) What do you when your boyfriend is a cat-person and you're a dog-person, and you have to hang out around each others' houses (with respective dogs and cats)? Oh, please consider my questions if the giveaway is open internationally. When you're in love with more than one person, how can you make up your mind, and how do you know that you've made the right choice? I also like Tore's question "Do you believe everyone has a soul mate?" I can't wait to read this book whether or not I win it! 'The Princess and the Hound' looks & sounds amazing. Are you planning more along the same lines? That is stories with a skew towards classic tales. Did you have to do specific alchemical research for the potions you used? I was wondering if you believe in love at first sight? Usually in fairy tales the characters seem so sure. How long was it in between publishing your first story and actually being able to quit your job and write full time? Are there any other fairy tales which you plan to retell / insert in your story, whether as a major spotlight or reference in the future?